Immunofluorescence images of oyster visceral mass tissue, with the specificity of Anti-Rabbit Alexa 488 (top row) and Anti-Rabbit FITC (bottom row) compared. Unstained samples (left column) were compared to test samples (right column) to visualize degree of auto-fluorescence. The absence of anti-SNAP served as the negative control (middle column), it has led to the absence of fluorescence at the same imaging and visualization setting for the green channels, implying the goat anti-rabbit IgG (Heavy & Light Chain) antibody FITC conjugate ABIN101988 is specific to Rabbit IgG antigen. Read validation report #100071 for application Immunofluorescence. Western blot of Fluorescein conjugated Goat Anti-Rabbit IgG secondary antibody. Lane 1: Rabbit IgG. Lane 2: None. Load: 50 ng per lane. Primary antibody: None. Secondary antibody: Fluorescein goat secondary antibody at 1:1,000 for 60 min at RT. Blocking: ABIN925618 for 30 min at RT. Predicted/Observed size: 25 & 55 kDa, 25 & 55 kDa for Rabbit IgG. Other band(s): None. 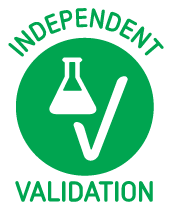 Notes We validate the specificity of the secondary goat anti-rabbit IgG (heavy & light chain) antibody (FITC) ABIN101988 for rabbit IgG antibody. Oyster visceral mass tissue is dissected and fixed in 4% paraformaldehyde in seawater overnight. Tissue is mounted in a paraffin block and hardened overnight before. Permeabilize in PBS with 0.05% triton X overnight. Wash sections in PBS 3 times for 15 min for at RT. Block sections in PBST with 1% BSA for 2 hours at RT. Incubate sections with CBD-SNAP antibody (lab stock) diluted 1:200 in PBST with 1% BSA overnight at 4°C to detect the location of chitin. 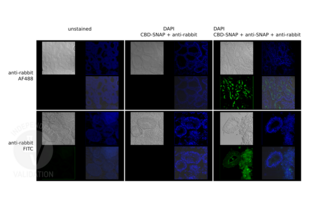 Additionally, incubate the CBD-SNAP and SNAP-tag double-stained sections with rabbit anti-SNAP antibody (antibodies-online, ABIN1573927, lot 13D000621) diluted 1:200 in PBST with 1% BSA overnight at 4°C. Incubate sections with the secondary goat anti-rabbit IgG (heavy & light chain) antibody (FITC) (antibodies-online, ABIN101988, lot 611-1202) diluted 1:400 in PBST with 1% BSA for 2h at °C. Wash sections in PBS three times for 15min at RT. Counterstain with 0.1µg/mL DAPI in PBS for 15min at RT. Mount sections on a microscopic slide using 50% glycerol in PBS. Seal cover slips with nail polish. Confocal imaging on Leica SPE. Visualization of the data performed on LAS 3D software. Experimental Notes To validate the specificity of the anti-rabbit FITC secondary antibody ABIN101988, 8µm paraffin sections of oyster visceral mass were observed in this study. We compared the fluorescence signals with immunofluorescence study. The negative control specimen was always compared with the test specimen or the positive control specimen on the same day, using the same laser power, gain, offset, accumulation/averaging settings on the Leica SPE confocal microscope. Visualization of the data was performed on LAS 3D software, with the same visualization setting to compare signal brightness. We found that the samples treated with anti-rabbit FITC secondary antibody ABIN101988 had similar fluorescence signals as the positive control Anti Rabbit Alexa 488. Excitation at the same laser wavelength and power did not generate fluorescence in the negative control section, when anti-rabbit FITC secondary antibody was applied in the absence of rabbit produced anti-SNAP antibody. Product cited in: Jiang, Xia, Yang, Shao, Liao, Zhu, Jiang: "Novel insights into a treatment for aplastic anemia based on the advanced proliferation of bone marrow‑derived mesenchymal stem cells induced by fibroblast growth factor 1." in: Molecular medicine reports, Vol. 12, Issue 6, pp. 7877-82, 2016 (PubMed). Background publications Blakeslee, Baines: "Immunofluorescence using dichlorotriazinylaminofluorescein (DTAF). I. Preparation and fractionation of labelled IgG." in: Journal of immunological methods, Vol. 13, Issue 3-4, pp. 305-20, 1977 (PubMed).